Grating the lemon takes some time and if you are not careful, some of your knuckles. Mine is still sore but the sacrifice was worth it. NOTE: You will need 5-6 T of lemon juice in total if you are making the glaze. Three lemons should be enough, but buy 4 just in case since the amount of juice in each lemon can vary. Finely grate lemon zest (just the yellow part, not the bitter white pith) from three lemons. Combine with 3 T of lemon juice in small bowl and set aside to soften. Adjust oven rack to lower-middle position. Heat over to 350 degrees. Coat bundt pan with butter and a little flour. Combine vanilla and buttermilk with lemon mixture. In standing mixer fitted with flat beater, cream butter and sugar at medium high speed until pale and fluffy, about 3 minutes. Scrape down sides, reduce speed to medium and add one egg at a time. Scrape down sides again, reduce to low and add about one-third of flour mixture, followed by half of lemon mixture, mixing until just incorporated. Repeat using half of remaining flour mixture and all of remaining lemon mixture. Scrape bowl and add remaining flour mixture. Mix and medium-low until batter is thoroughly combined, about 15 seconds. Fold batter into prepared bundt pan. Bake until top is golden brown and knife or toothpick inserted into center comes out with no crumbs attached, 50-60 minutes. 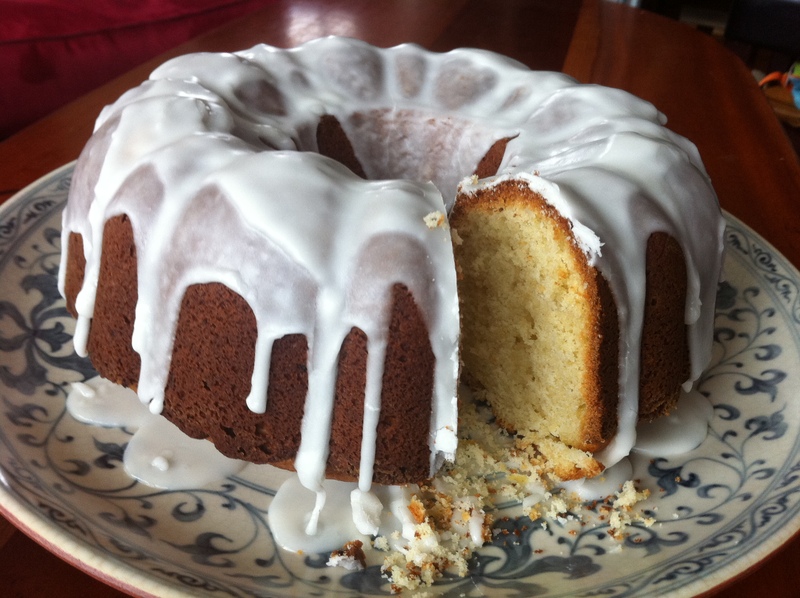 While cake is baking, whisk 2 tablespoons lemon juice, buttermilk and confectioners’ sugar until smooth, adding more lemon juice gradually as needed until glaze is thick but still pourable (mixture should leave faint trial across bottom of mixing bowl when drizzled from whisk). Cool cake in pan on wire rack for 10 minutes, then invert warm cake directly onto the rack. Pour half of glaze over warm cake and let cool 1 hour. Pour remaining glaze evenly over top of cake and continue to cool to room temperature, at least 2 hours. Enjoy!